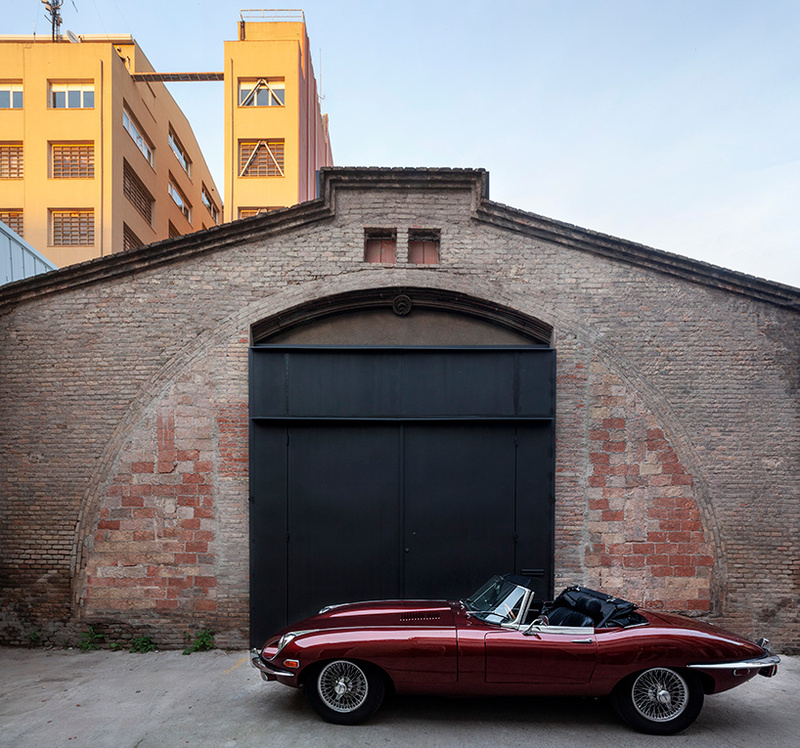 barcelona- and mexico city-based firm cadaval & solà-morales has converted a former toilet paper warehouse into a contemporary live-work space. 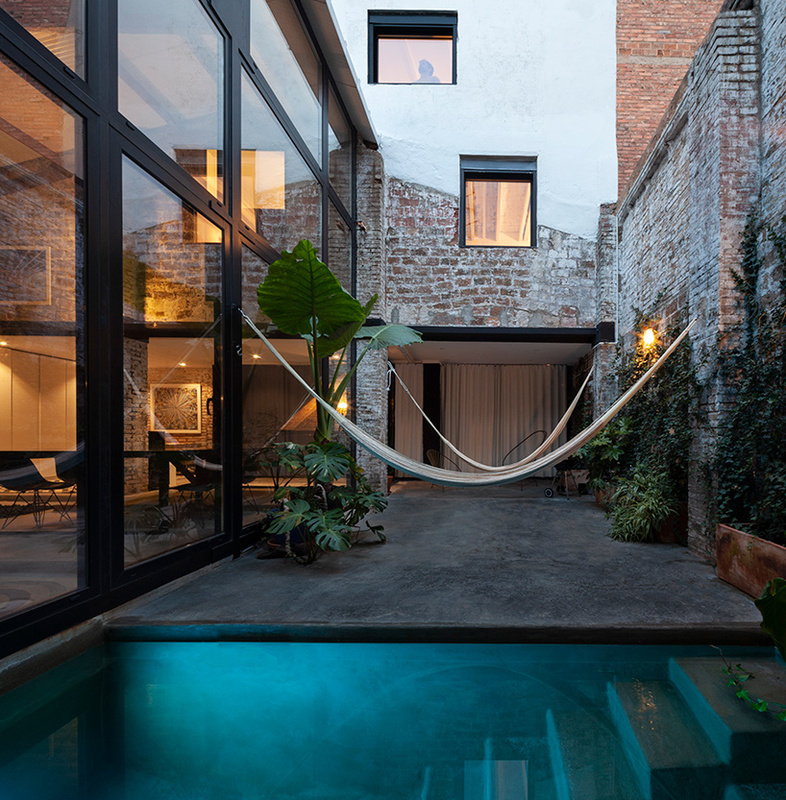 located within barcelona’s vibrant el poblenou district, the building was originally constructed as a theater in the late 19th century. 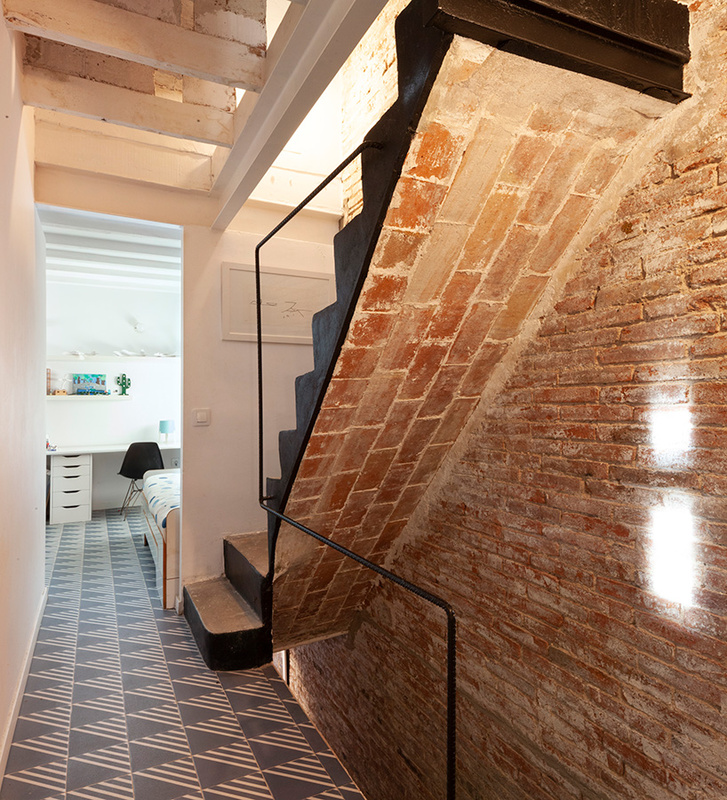 by exploiting the structure’s scale and size, the project seeks to recover and capitalize on the spatial qualities present as a result of the building’s original function. 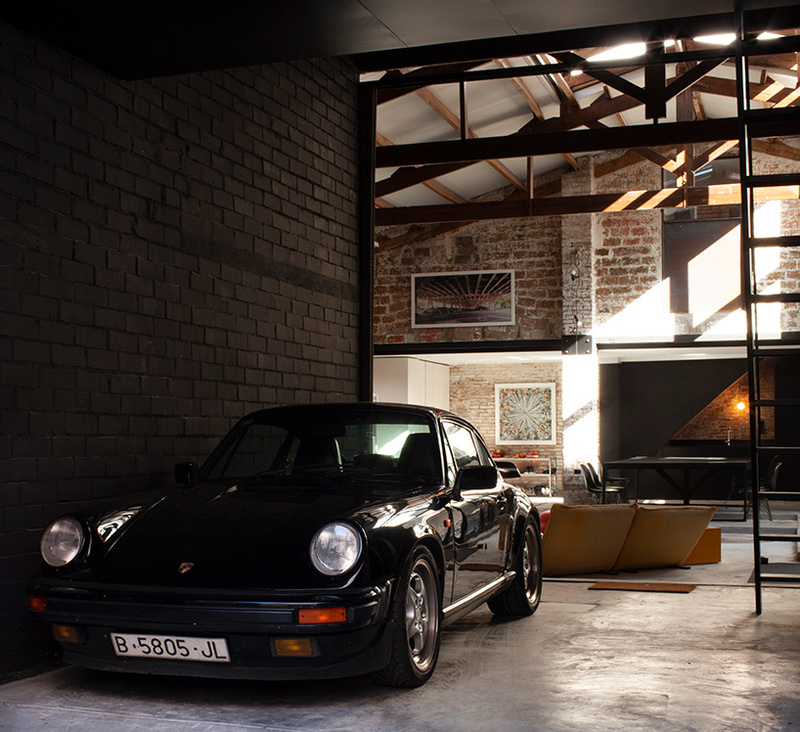 residents and guests access the house through an entrance where a classic car appears as a piece of sculptural art. 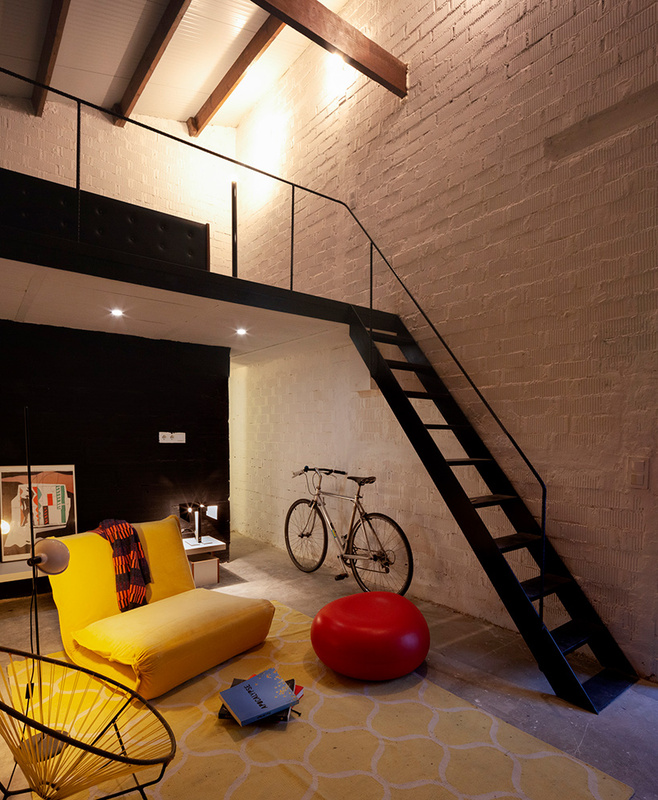 the home is articulated around a vast central space that has been programed for loft-like use. 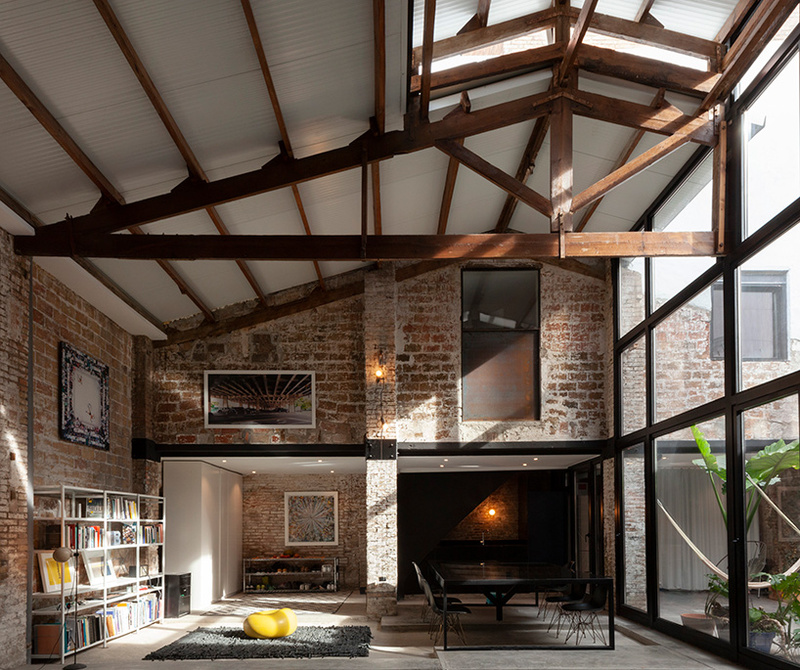 here, the lounge, dining room, kitchen, and study share a single space that despite its scale becomes cozy thanks to the accumulation of uses, objects, and the textures of its exposed materials: wood, metal, brick, and stone. 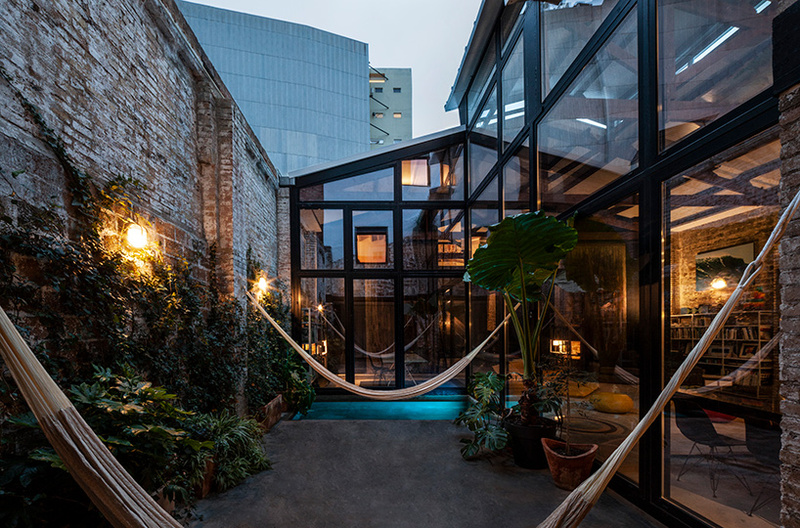 by removing part of the warehouse’s roof, cadaval & solà-morales created a patio that serves as an outdoor extension of the main living area. the patio offers a setting for meals surrounded by vegetation. meanwhile, a small swimming pool provides a place to cool off and unwind after exercise or work. 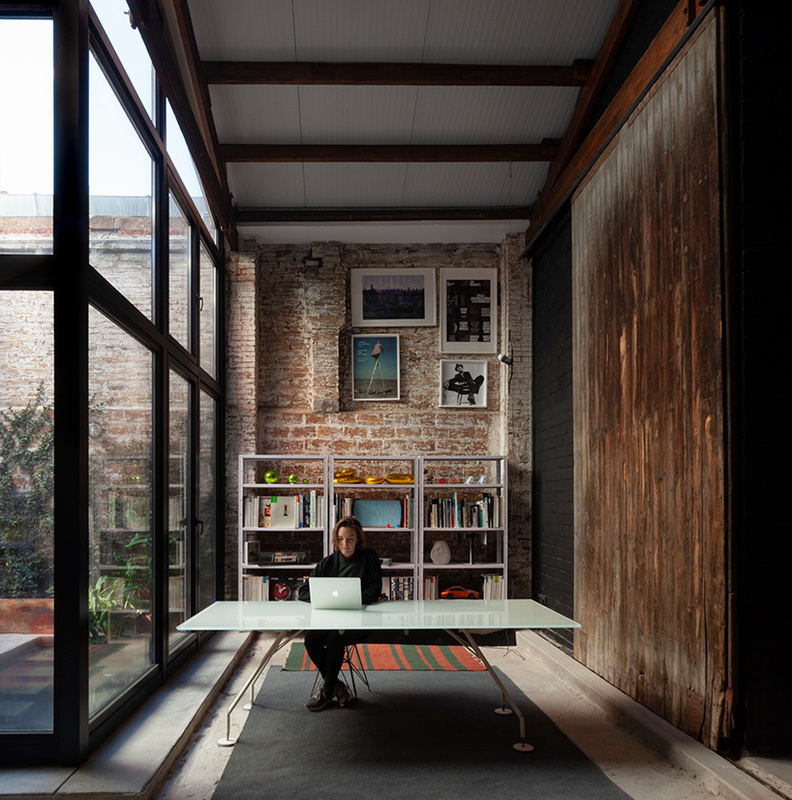 this void also ensures that the rest of the home is naturally illuminated and ventilated. 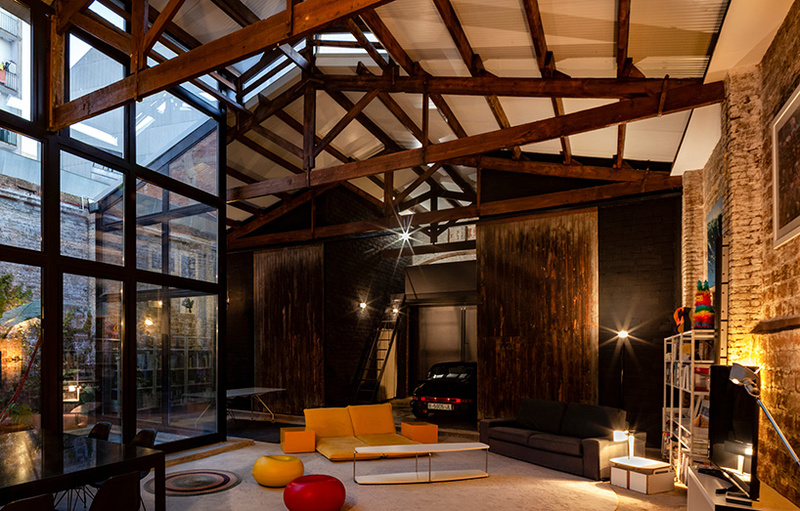 illuminated by two large windows that establish a direct relationship with the street, two work studios are positioned above the entrance to the house. 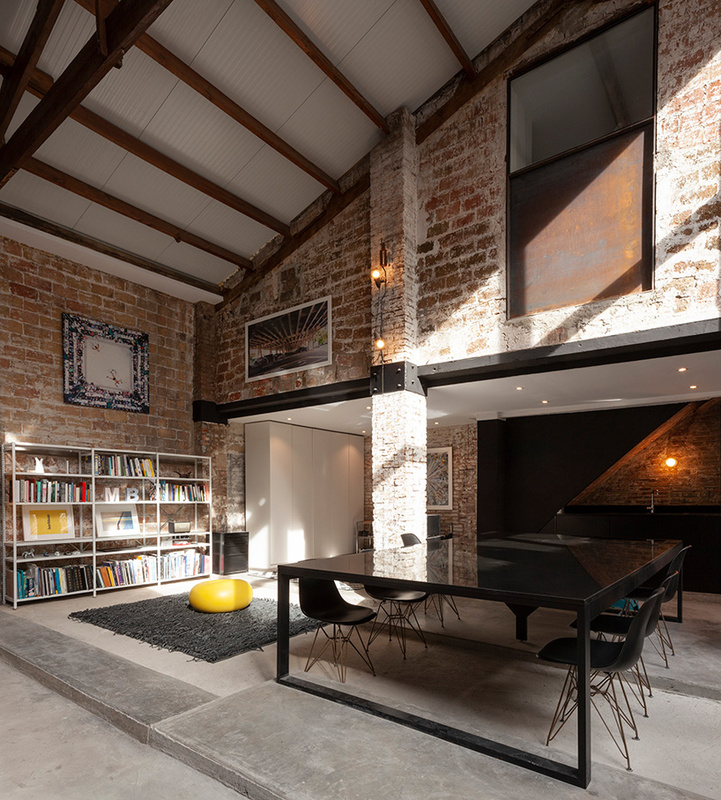 both studios occupy a mezzanine level with an area for a kitchen and a bathroom on the ground floor. 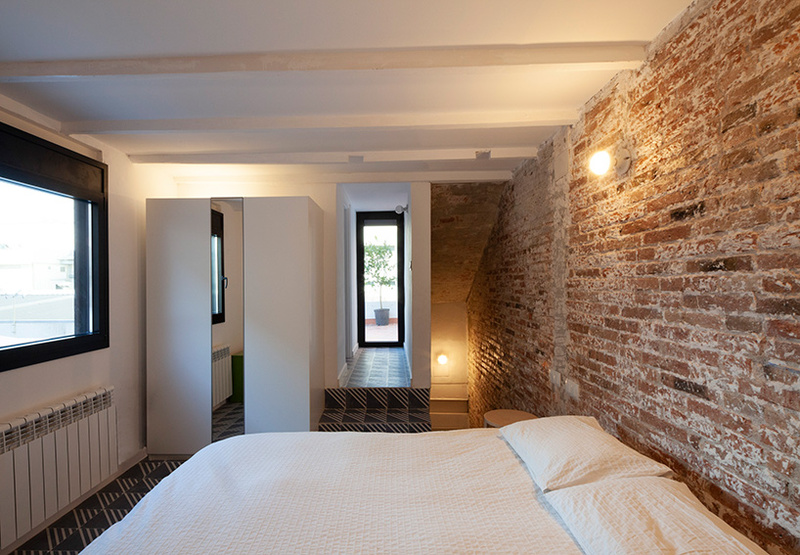 the sleeping quarters are found at the opposite end of the property, with two bedrooms on the first floor, and another, with an adjoining terrace, situated on the level above.